Elections in Ukraine always stir considerable interest in Russia. Political scientist Leonid Radzikhovsky explains why Ukraine is a mirror in which Russia views itself. The preliminary results of the parliamentary elections to Ukraine's Verkhovna Rada are in: first place (as in 2007) belongs to the Party of Regions, though its results this time were even better. Second place went to the party Batkovschina, which fared much worse than it had in 2007 – when it was known as the "Bloc of Yulia Timoschenko." The Communist vote also soared, and the party is now in third position. As expected, Yuschenko's party (third in 2007) failed to cross even the 5 percent threshold. 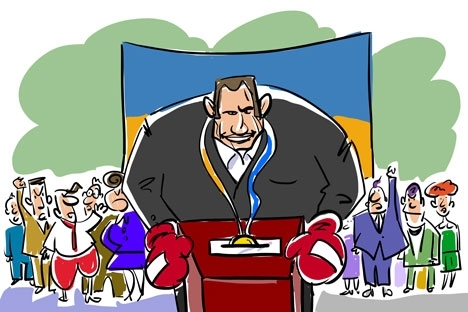 However, the Rada has welcomed two new parties: Udar (meaning "Punch," headed by Vitali Klitschko) and Svoboda ("Freedom"). Klitschko is a boxing hero and perhaps the most popular man in the country. Yet it is easier to win trust through gold medals and world titles than to earn it in the political ring. Great athletes do dabble in politics, but it is a struggle to recall any who have made it to the top (and Klitschko's aims are, of course, nothing short of presidential). Russians look upon Ukraine sometimes with affection and sometimes with jealousy – but always with keen interest. The "earth-shattering excitement" of NATO membership or reunification with Russia has long since dampened. It is now obvious to all and sundry that neither will happen (nor will the "disintegration of Ukraine" into a "Russian East" and a "self-reliant West"). History and geography do not depend on any one politician or individual. Russia and Ukraine are close neighbors, related by language, religion, ethnicity, and nationhood — two different, equal countries and two peoples, not one. These are the checkboxes that no political maneuvering on either side will ever change. Putin's maxim that "Ukraine has no pro-Russian or pro-American politicians, only Ukrainian politicians," is no longer doubted by anyone. Incidentally, former president Yushchenko got burned not only because of his obvious personal weakness and helplessness, but because he tried to carry through a "pro-American" agenda (as he saw it) and thereby ceased to be a "Ukrainian politician." As for the present incumbent, although an antagonist of Yushchenko, Yanukovych is not overtly "pro-Russian," but tries to implement "Ukrainian" policies (again, according to his personal interpretation). Despite his low ratings – traditional for all Ukrainian presidents – Yanukovych very quickly "seized the reins of power." Moreover, he really does have administrative ability, not just in comparison to the "presidential greenhorn" Yushchenko, but in comparison, perhaps, to any of his predecessors. However, Ukraine is of interest to Russia not only as a partner in a political marriage of convenience. Ukraine is also a mirror in which Russia can view itself (and vice versa, of course). In many ways, the two countries run parallel to each other. For example, there are the demographics. In terms of population, both Russia and Ukraine peaked in 1993, and both have been in decline since. Still, Ukraine's drop is much more severe than Russia's. In 1993, Ukraine was home to 52.2 million people. Now, it is 45 million – difference of more than 7 million souls, or nearly 15 percent of the population. In the same period, Russia saw a reduction from 148.5 million to 142 million — about 4 percent. Of course, a neighbor’s grief does not make one’s own problems any less real; but it gives a sense of scale and perspective. The birth/death ratio in the two countries is about the same (birth and death rates are both slightly lower in Ukraine than in Russia), but Russia has positive migration, and Ukraine has negative. No wonder: in Russia, GDP per head is $17,000, while in Ukraine it is $7300. Of course, Russia's pre-eminence is, in many ways, a result of its raw materials bounty; but no one cares about the reason, so much as the consequences. An acquaintance in Donetsk receives a pension of $150 per month (for the record, many women retire at 60, and $150 is considered average!). Miners – retirement age 45 – get $400, which is about the average in Russia. It is not difficult to understand why migrants flow from neighboring countries into Russia, and not the other way round. The two countries' political systems are often compared. The differences are obvious: Ukraine's Verkhovna Rada is a combat arena, while, in comparison, Russia's State Duma is a library reading room. Ukraine has genuine, tough competition between comparable forces and a regular succession of presidents, while, in Russia, power is absolute and unchanging. This is indisputable. But rumors of the pernicious (or salutary) impact of stable (or changeable) power are greatly exaggerated. Ukraine is a case in point. There, political competition has not translated into economic competition, or an independent judiciary, or human rights, etc. Furthermore, rhetorical competition does not always unearth the most "effective manager," and competition in the public field is not a guarantee that the best choice will be made. At the very least, the story of Yushchenko is evidence of that. Twenty years of independent Ukrainian elections have shown that rearranging the furniture will not make it any more comfortable. On the other hand, lack of competition is certainly not conducive to successful governance. Whereas in Western Europe there appears to be a direct link between having a representative democracy and an effective state and economy, in Ukraine there is no such corollary. Of course, it can be said that "too little time has passed; and, anyway, it's a different kind of democracy." But it is clear that the issue is not as clear-cut as many imagine it to be. Even more puzzling is what comes first: "the chicken of democracy" or "the egg of economic success." In any case, Russia and Ukraine are hard-pressed to utilize each other's experience, either through emulation of success or avoidance of mistakes: the political competition of the "Ukrainian Sich [Cossack encampment]" is just as limited as the political monopoly of the "Russian Empire." Leonid Radzikhovsky holds a doctorate in psychology and is an independent political analyst and political scientist.